The air was filled with anticipation at the beautiful Stein Auditorium of the India Habitat Centre on an overcast evening earlier this month. Arriving a bit early, the soundcheck itself was a treat for the ears of lovers of music. Anupriya Violin Academy, in association with Sahitya Kala Parishad and Department of Art Culture and Language organised Music Beyond Words, where Violin maestro Anupriya Deotale performed a musical recital on the poetic works of her father, legendary poet Prof Chandrakant Deotale. The event was attended by high profile names of the Indian Classical music fraternity of Delhi and NCR as well as Ashok Bajpayee, famous Hindi poet and close associate of Chandrakant Deotale, and Deputy chief minister of Delhi Manish Sisodia. 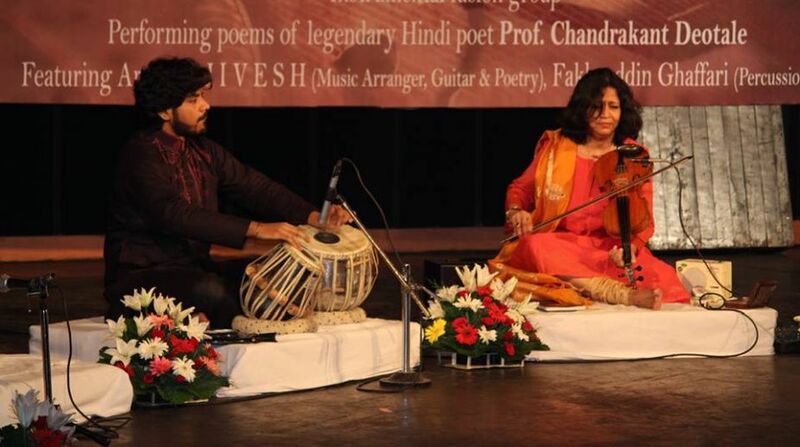 Before they got to the musical recital of the poetry, Anupriya Deotale, accompanied by Zuheb Ahmed Khan on Tabla played a 25-minute long Raag. Their musical chemistry filled the room with a noble aura and had the audience on their feet once the raag ended in a standing ovation. After that, Anupriya commenced with the recital of her father’s poetry, giving the music with Zuheb Khan on Tabla, Fakhruddin Ghaffari on percussions and Jivesh Singh on Guitar who was also the one to recite all of the poetry. The fusion music brought to life by the artists fit like a glove with the poetry of Chandrakant Deotale. “The youth has generally lost its direction when it comes to Classical musical, western or Indian, and it is very important that they start to listen to more of it. With the speed of the songs today, Bollywood music causes a distraction to the true arts and is terrible for the thinking process,” said Anupriya Deotale after the concert. When asked about how hard it is for a person with no musical backing to get into the music scene , she explained that it is not hard at all, what with all the music schools that are already established. “It is very easy nowadays to find yourself a good teacher or Guru,” she said and stressed that anybody could learn, if they put their mind into it.